It's a cool thing having some few records of your conservation between you and a person on a mobile device. Actually, it has really helped most individuals especially when it comes to making a business calls. The blackberry 10 recently added such features through the use of an app commonly known as phone tap through the help of Hub++ developer. 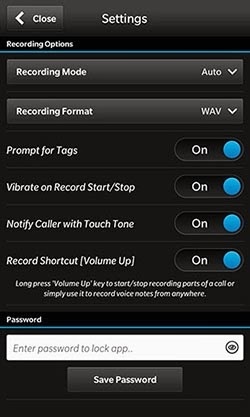 To cut the story short, the phone tap as an interface and other related features just like the hub++ due to it's from the same developer, most especially, its recording formats is either .AMR, .M4U, and .WAV, that depends on the format you wish your recording to be, and another cool feature is that you can enable lock codes for your recorded calls with much more features. After downloading it, then quickly run and install the app and grant all neccessary permission it demands durning installation. Once this is done, you are free to make a quick testrun on the app to see the rest of its cool features.